Iridium Spark Plugs GM LS. 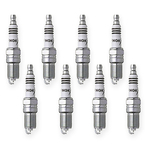 Iridium IX - The ultimate evolution of a performance spark plug. It may be time to invest in precious metal futures. NGK Iridium Spark Plugs represent the ultimate evolution of spark plug technology and performance. Iridium allows for a center electrode 75 percent the size of a platinum electrode and 24 percent the size of a conventional nickel electrode. The fine electrode tip is engineered for greater ignitability. And it's in the design of the iridium tip that makes Iridium IX a better spark plug. The electrode is not too thin and not too thick. It's just the right size to reduce the voltage required for spark and to maximize the overall longer life qualities of iridium. Set of 8 spark plugs.